External Oil Combi Boiler – An external oil combi or combination central heating oil boiler is an innovative space-saving concept.An external oil combi boiler is both a high-efficiency hot water heater as well as a central heating boiler integrated, hence the name, within one compact unit. Consequently, no separate hot water cylinder is required, therefore conserving space within the property. In over two thirds of homes in the UK, a Combi Boiler is an instantaneous domestic hot water heater as well as a central heating boiler combined.Water is heated up directly by means of a thermal store when a tap is turned on on, saving not only on cost, but additionally on the space needed for a hot water storage tank. Supplying immediate access to hot water. An oil combi boiler is especially suited to smaller sized homes with one bathroom as well as a shower/ en suite. How Does an External Oil Fired Combi Boiler Work? An oil combination boiler system operates in a comparable way to its gas powered alternative, utilizing an oil fired boiler to heat water, which provides the central heating via radiators as well as hot water through the taps in your home.The primary difference between the two is that an oil-fired boiler needs a continuous oil supply, delivered and stored in an oil storage tank. 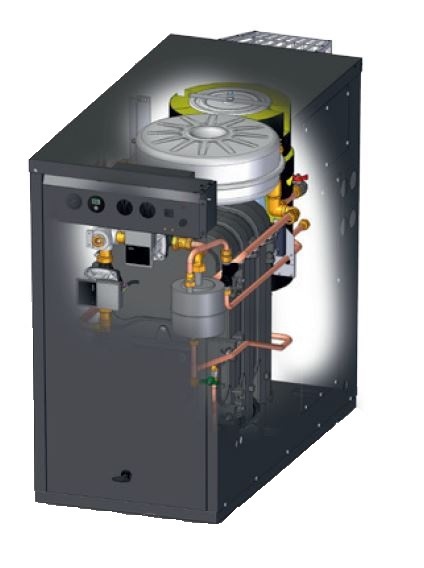 Most oil-fired combination boilers have an internal plate heat exchanger to supply domestic hot water , which is the same system used by gas combi boilers.The appeal of oil fired combi central heating boilers is expected to increase in the UK since they have many benefits over various other kinds of heating systems. A central heating boiler is basically a furnace, burning fuel to produce heat, and an oil combi boiler works on a fairly straightforward principle. Various boilers have different configurations, yet they all make use of a device called a heat exchanger, which transfers heat efficiently and effectively from the burning oil to the water. When you turn on the hot tap, that’s the boiler’s cue to wake up and start functioning. The water comes via the boiler on its way from the mains to your tap, and as it does so, it flows over a small sensor which informs the boiler to begin burning the oil. The heat exchanger inside the boiler gets hot; the water then flows through the heat exchanger and gets hot too and arrives in your bath nice and piping. A similar thing occurs when you switch on the central heating. The boiler fires up its oil burner, and then a pump inside the boiler begins pushing water through the heat exchanger. The warm water flows out through a pipe into the radiators, making your home nice and warm, and after that back into the boiler where it gets heated up once again replacing the heat it has lost to your rooms, and so on and so forth.The water for your central heating system, and the mains water that you drink and wash in, come through two completely separate pipes. Oil Combi boilers are extremely efficient when compared to older oil boiler models. In fact, replacing your boiler with an external oil combi boiler could potentially save up to £300 a year on your heating bills. External Oil Combi boilers are far less complex and complicated compared to traditional heating systems, which means that installations tend to be cheaper ans easier. It is also easier to find replacement parts if a problem may occur. Without the need to heat up a water tank ,external oil combi boilers can provide an unlimited supply of hot water on demand. No waiting time for the hot water cylinder to warm up ! As there is no need for a separate water tank, an external oil combi boiler system takes up much less space than conventional heating systems. This makes them ideal for homes that have limited room, and often a much easier install too ! The cold water from a combi boiler system is always safe to drink as it is fed directly from the mains. However, this is not always the case with traditional systems, which may store cold water in a tank before it is piped through the house. As oil combi boilers tend to be more efficient than other boiler types, this can be a selling point if you are looking to rent or sell your property. This will also show on the Energy Performance Certificate (EPC). The popularity of external oil combi boiler’s means that a large majority of boiler engineers are trained how to repair and service them. This makes it easier to find a qualified engineer in your area. We do 2 models within our our range of External Oil Combi Boilers – a 15 kW to 22 kW Output model , or 51,180 to 75,064 BTU’s, this external oil combi boiler would normally be suitable for smaller semi detached or terraced properties and bungalows alike , but please consult a heating engineer or plumber should you be in any doubt of what size boiler you require. For those who want more information on domestic heating by oil: boiler systems – guidance for installers and specifiers, this PDF has some great information on all the considerations. In the UK we like our domestic hot water produced at 60C , the main reason behind this is that at this temperature is Legionella – Legionella bacteria are naturally occurring organisms present in many water systems, and if exposed to human beings can cause the development of Legionnaires’ disease, this is particular the case when the water is in an aerosol ( mist )state e.g. showers. compensates for variations in supply pressures or temperatures so as to maintain a safe temperature. Moreover, in the event of cold water supply failure, the thermostatic mixing mechanism will automatically “shut down”the flow so as to prevent dangerously hot water being discharged.For more details on this area, please download this leaflet below . If they are not, then this isn’t a problem , you can just use one of our non combi external oil boilers , linked into a domestic hot water cylinder , for more information on this range , please see our products page. So generally speaking , our external oil combi boilers are suitable for buildings with one bathroom , containing a bath and or shower, if you have two bathrooms ( which both could be in use simultaneously) , or a large drench type shower , with high flow rates , then you need to be looking at boiler and domestic hot water storage cylinder system as your answer. Whether you call these oil combi boilers, an outdoor oil combi boiler or an outside oil combi boiler is you preference, and that’s fine with us. The trade (most heating engineers) will call these oil combi boilers an external oil combi or external oil combination boiler. However you wish to refer to them is fine, all we can tell you is that we supply a quality product , that is fully weatherproof and is made with quality branded components, ensuring a long and trouble free service life, with the benefit of having the boiler external to the property any associated smells of oil that you can have with an internal oil combination boiler are eliminated with the added benefit in that any service engineer / plumber doesn’t need access to your property to work on the boiler, which leads to less inconvenience and often less mess to clean up after. All of our external oil combi boilers have been designed and manufactured to the following standards – OFTEC OFS A100, European Directives BED 92/42 and EEC LVD EN 60335-1 and EMC 89/33C/EEC and are WRAS approved. They are designed to burn Kerosene 28 Class C fuel – to British Standard Specification BS 2869 Part 2 Class C2 , European standard BS EN 2869:2010 Class C2, which are also referred to as Heating Oil, 28 Second Burning Oil or Central Heating Fuel. This grade of Kerosene has clean burning characteristics whilst maintain a high heat output and maximum fuel economy.